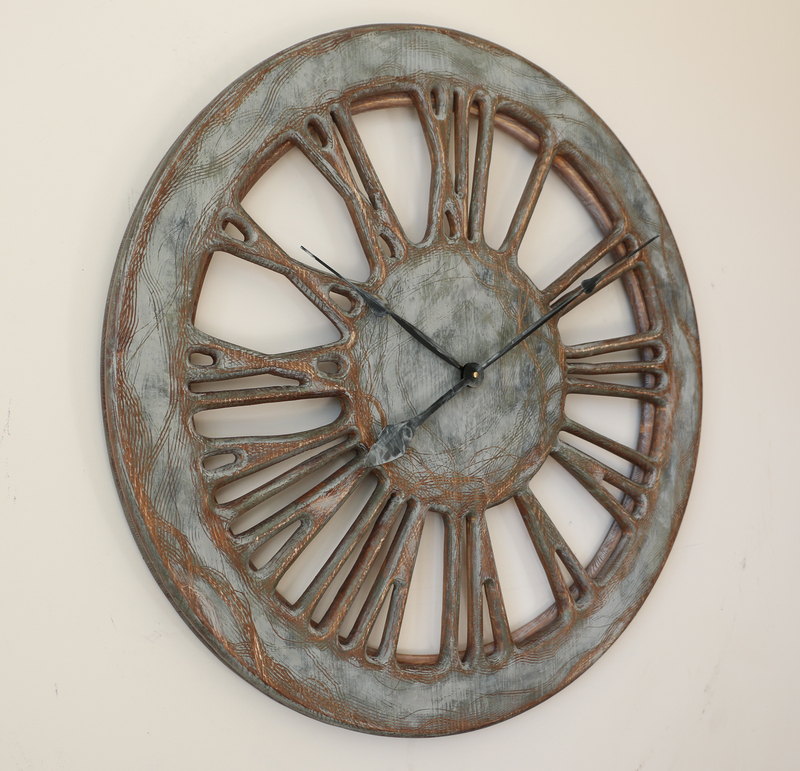 Stunning decorative wall clock that would bring distinctive character to your interiors. 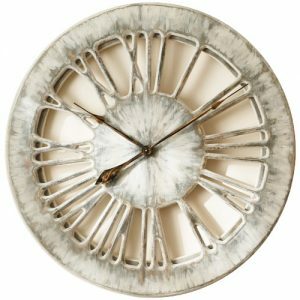 One of the most luxurious designs in our online shop that would suit well customers with sophisticated and expensive taste. 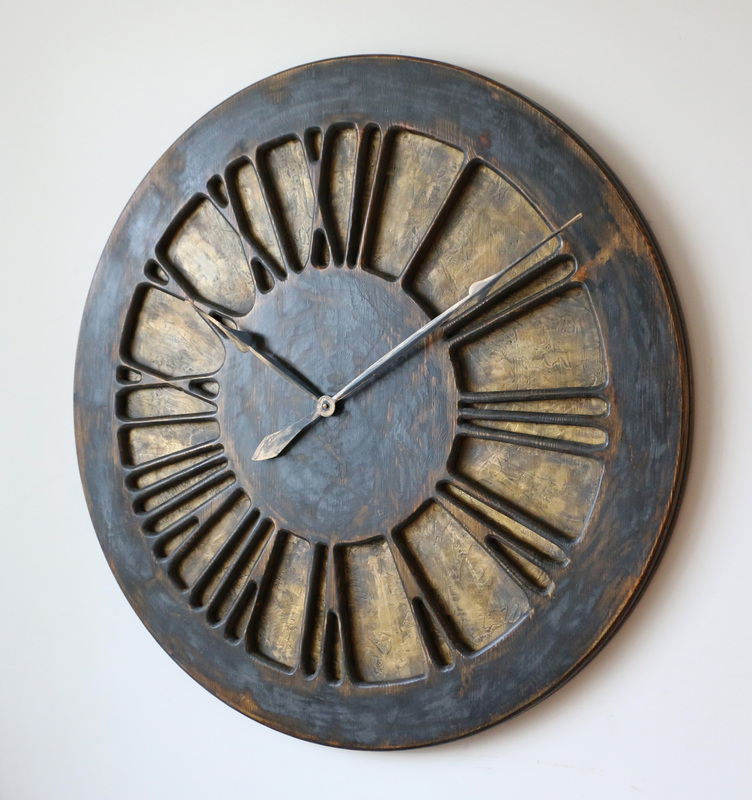 Large dark Roman Numerals are contrasting beautifully with rich golden background. If you are looking for a feature and not only the time telling device you won’t be disappointed. Although our timepieces are more expensive than average they also providing a true “wow” factor. The online market is overflowing with cheap products that all look identical. While different suppliers compete on price, at Peak Art we are going in the other direction. 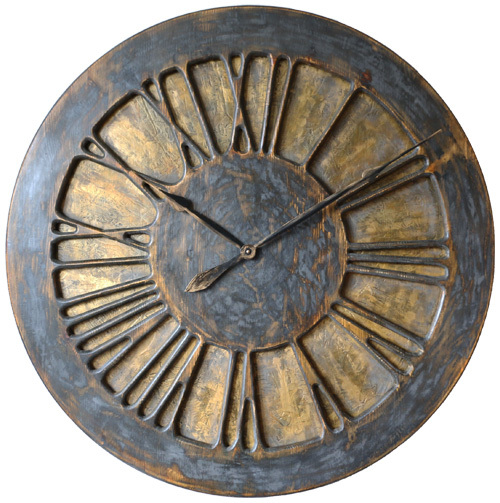 Every large decorative wall clock from our collection is unique. This lets us stand out from the crowd. 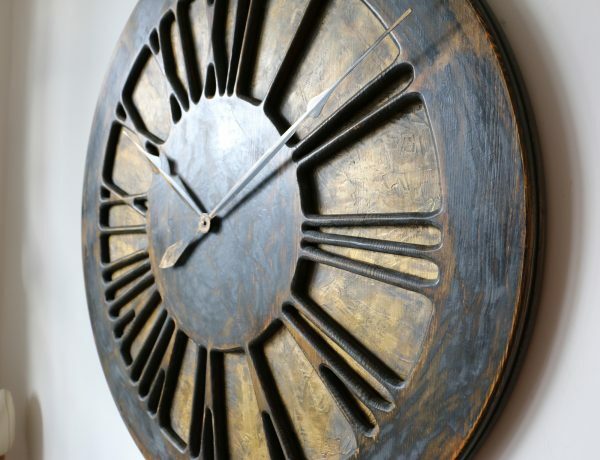 The beautiful timepiece you can see here is made of two large panels of pine wood. We have hand carved and hand painted it and then bolted together to provide the strong “wow” factor. 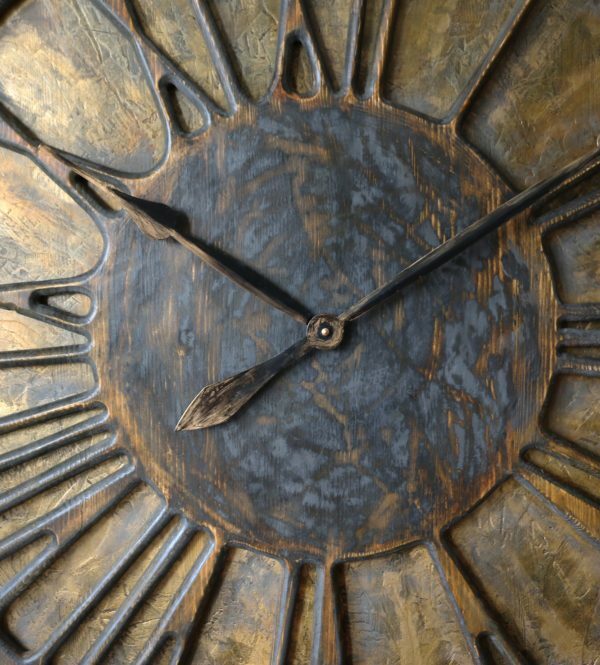 The most impressive roman numerals have dark graphite colour to contrast well with the rich golden background. You don’t need to worry about drilling the walls to provide the power because the clock only needs a single C-Cell battery that should last 9-12 months without any problems. 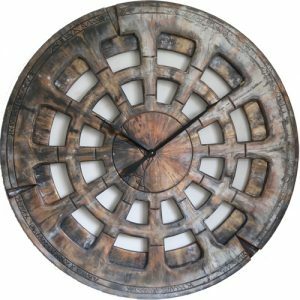 We can make three different sizes of this design that includes 30″ (75 cm), 40″ (100 cm) and even 48″ (120 cm). This should cover most scenarios for the available wall space. If you really want a statement clock it shouldn’t be any smaller than 30″ anyway. 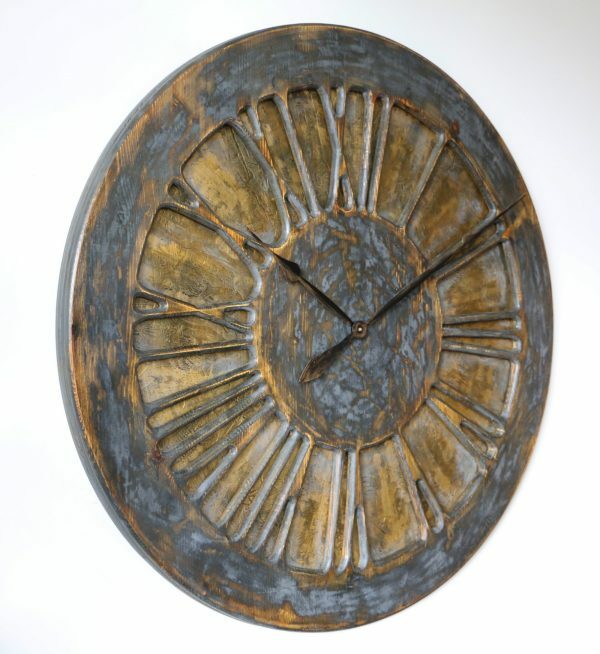 Why selecting large decorative wall clock from Peak Art? 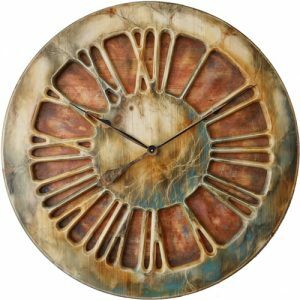 What makes Peak Art stand out when compared to every other company that tries to sell decorative wall clocks? Our main goal is not high turnover or cutting the cost to increase the profit. We simply want to change the way of thinking about the clock as something that only provides the time. 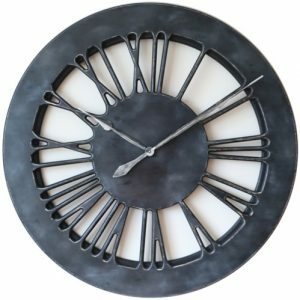 We want people to consider our massive handmade timepieces as the alternative way of filling large wall space with three dimensional functional art. If you are looking for a large clock to decorate your living space, don’t follow the old trends. 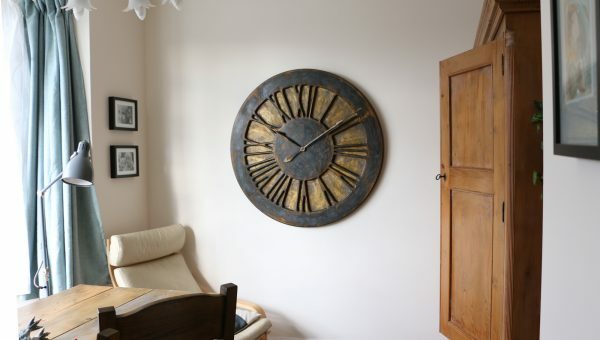 Those big metal wall clocks you can see on the internet are all the same. 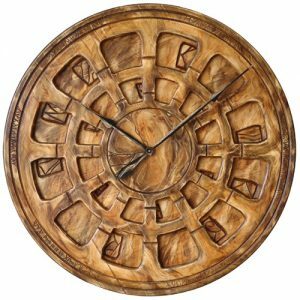 Therefore if you need uniqueness and character you are better of searching for large handmade clocks and we are leading this niche market.